(Bloomberg) -- Proponents of bump stocks, the aftermarket attachments that can make a semiautomatic rifle behave like a machine gun, asked a U.S. appeals court to block a federal rule that will make ownership of such devices illegal on March 26. A three-judge panel in Washington heard two hours of arguments Friday on whether it should overrule a lower court’s refusal to delay enforcement of the measure while the proponents challenge its legality. In October 2017, Stephen Paddock allegedly used weapons with bump stocks to kill 58 people while perched in the window of a Las Vegas hotel room overlooking a music festival. A federal appeals court in Denver Thursday put enforcement of the new rule for a Utah man who challenged its legality. 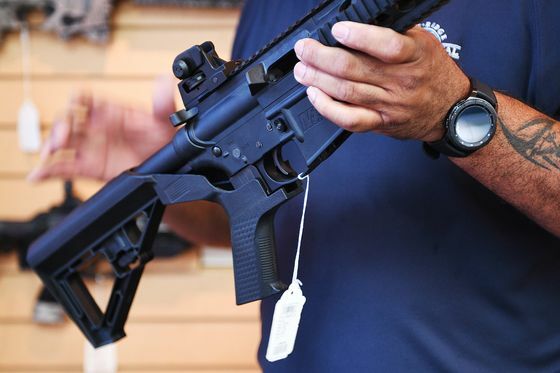 The suing bump-stock owners and gun-rights’ advocates contend the Bureau of Alcohol, Tobacco, Firearms and Explosives regulation issued in December arbitrarily changed the government’s longstanding definition of machine guns -- which have been heavily regulated in the U.S. since 1934 and virtually banned since 1986 -- rendering possession of their devices a crime. At issue is what can be accomplished with just the single pull of a trigger. The government’s machine-gun ban is based on the notion that a single pull of a trigger can unleash a volley of shots, while the bump-stock-modified rifle requires a simultaneous forward pressure from the user to channel the weapon’s recoil energy into moving the gun back and forth even as the trigger finger remains steady. That means a bump-stock-modified gun doesn’t qualify as a machine gun because it arguably constitutes two actions, not one, Washington appellate lawyer Erik Jaffe told the panel on Friday. To say otherwise, he added, reverses the government’s 70-year-long position on the subject. Any ambiguity on the question suggests the court should rule in his favor. "All I need to show is some reasonable prospect of success on the merits," he told the panel of two Democratic presidential appointees and one appointed by a Republican. "I don’t even need a particularly good argument on the merits." Government lawyer Brad Hinshelwood countered that there is no ambiguity, and that the government’s reading of the regulation is its best reading. "As a legal matter, these devices should have never been available to the public in the first place," he told the court. Still, U.S. Circuit Judge Sri Srinivasan -- a 2013 appointee of President Barack Obama -- questioned why the court shouldn’t delay enforcement of the regulation so the issue can first be fully litigated on the merits. Joining him on the panel was another Obama-nominee, Judge Patricia Millett, and Karen LeCraft Henderson, who was selected by President George H.W. Bush in 1990. The case is Guedes v. Bureau of Alcohol, Tobacco, Firearms and Explosives, 19-5042, U.S. Court of Appeals, District of Columbia Circuit (Washington).